Fireplaces come in a range of different styles that allow for both vented and vent-less burning. Gas fireplaces rely on natural gas emissions to maintain the combustion process and keep a fire going. The presence of kerosene odors occurs due to the byproducts produced when burning vent-less gas logs. Gas fireplaces can use vented or vent-less logs. When burning wood or other combustible materials in a fireplace, combustion gases and smoke are directed up through a flue passage that runs inside the chimney. This process is known as venting. For gas-powered fireplaces, homeowners have the option of using vented gas logs and venting combustion gases, or they can use vent-less gas logs, which don't produce the smoke and gases found with vented gas logs. In the case of vent-less gas logs, it's not uncommon for a fireplace to emit a kerosene odor when the flue vents are closed. Since vent-less gas logs burn without the ventilation afforded by vented gas logs, the combustion process works a little differently in terms of how heat is generated. In the case of vented gas logs, the draft from the flue works as part of the combustion, or burning, process. The draft also works to pull smoke and gases up and into the outside air. With vent-less gas logs, the carbon and hydrogen materials contained in natural gas recombine with oxygen and hydrogen to produce carbon dioxide and water vapor. In effect, the end product appears as heat. When natural gas does not burn off completely, a fireplace will emit kerosene odors as a byproduct. In its purest form, natural gas has no odor as a gas or when burned. However, natural gas distributors add additives or impurities to gas supplies for various reasons. One of these additives comes in the form of a rotten egg smell that's designed to alert users of gas leaks. Methyl mercaptan acts as another additive used with natural gas. When burned, methyl mercaptan has an odor similar to burnt matches and rotten eggs. 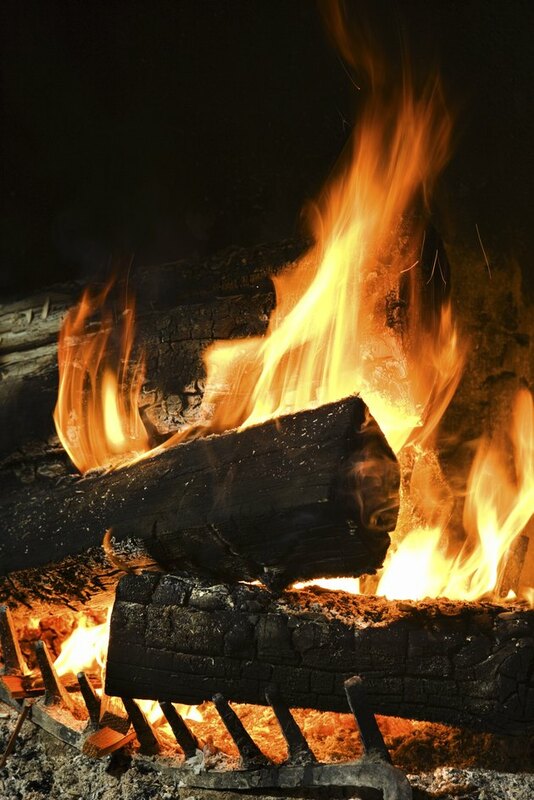 When vent-less logs burn in a fireplace, natural gas additives burn along with the gas. As a result of this combination, fireplaces will emit a kerosene odor when burning within a vent-less environment. While the presence of kerosene odors may not indicate a problem with the fireplace, burning logs within a closed vent fireplace can produce other undesirable effects. Faulty or incomplete combustion processes can cause soot to accumulate on burning logs. Soot results from partially-burned natural gas emissions. When this happens, some of the carbon used in the combustion process turns into soot while other carbon molecules join with oxygen to form dangerous carbon monoxide gases. Even in cases where no soot accumulates, burning vent-less logs for long periods will deplete the oxygen supplies in a room, so some form of ventilation is necessary after a while.